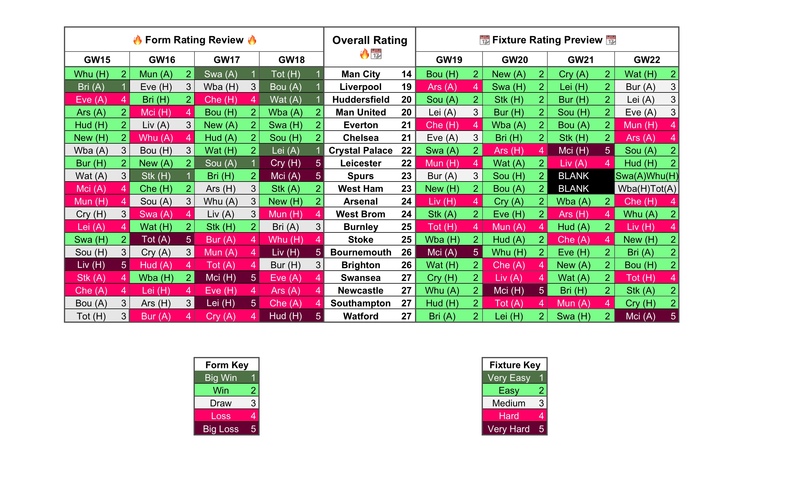 The halfway point of the season is almost here, so let the charts inform your Gameweek 19 transfer decisions. 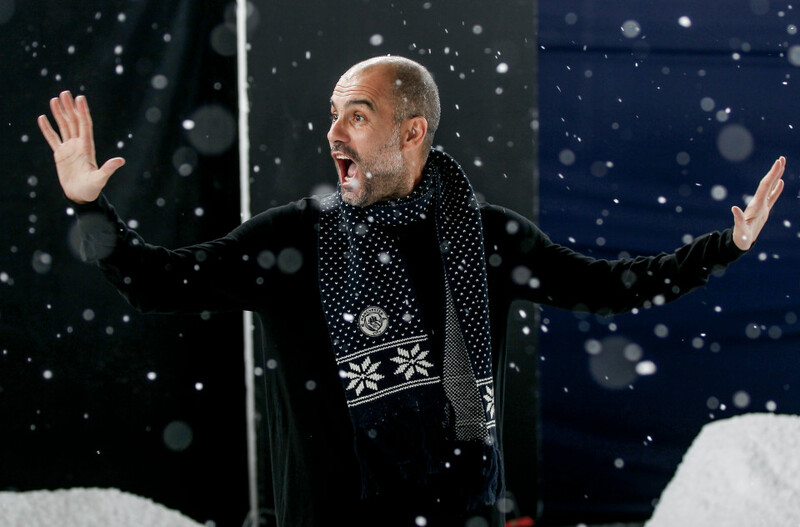 Manchester City are back on track. 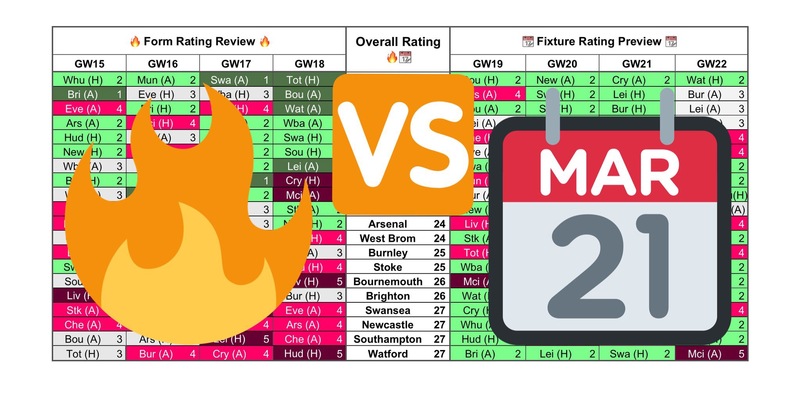 They’ve had to grind out narrow wins in recent weeks, but now they’ve had back to back easy wins and there’s straightforward games coming up, from Gameweek 19 onwards. A triple up is back on the cards, but I’m still a bit reluctant on the defence. They’ve kept just one clean sheet in their last 9. Otamendi is the top goal scoring defender and remains a constant threat from set pieces plus, with Kompany and Stones out injured, he will be a consistent starter over the festive period. De Bruyne and Sterling are the form options in midfield and are wise for investment if you don’t own them already. De Bruyne looks to be worth the extra funds, since he has started every Premier League game for City this season. Look out for who get’s minutes in the Carabao Cup tomorrow. Liverpool, Everton and Crystal Palace are now unbeaten in the last 4 games. Liverpool are managing to keep some clean sheets and Robertson has emerged as a cheap starter here. The attack is all about Salah, but Coutinho and Firmino come in at a slightly cheaper price point and are differentials in comparison to Salah’s massive ownership. Everton are thriving under Big Sam, and are starting to get some decent returns. The fixtures aren’t the best, but Kenny is getting attacking returns as well as clean sheets. In attack, Calvert-Lewin is an excellent budget forward and Wayne Rooney isn’t far behind, with penalty duties keeping his scores consistent. Sigurdsson is also getting attacking returns, but the higher price point and depth of midfield options means he’s less of an asset. Crystal Palace are looking revitalised under Roy Hodgson. Julian Speroni looks to have earnt the top goalkeeper spot and is a bargain at £4.1 million. They’ve kept 3 clean sheets in their last 5. In attack, Wilfried Zaha and Reuben Loftus-Cheek are both performing and are decent value for money. Benteke is facing a suspension in Gameweek 19 which should boost Zaha’s output in the short term. Huddersfield face the easiest run of games; followed by Manchester United, West Brom, Stoke and Brighton. It’s worth noting that Tottenham and West Ham have a blank Gameweek followed by a double Gameweek 22. Huddersfield and Manchester United hold a decent position in the charts so warrant investment. I’d maybe hold players from the other sides but not buy, due to their form. From Huddersfield, Schindler and Zanka are cheap defensive options. There’s always a lot of rotation in attack, but Mooy will be a decent returner and he is in most set pieces. Paul Pogba has had a long break for Manchester United, so should start most games over Christmas. Romelu Lukaku has scored in back to back games, and should be a captaincy contender over the next few weeks. Beware Zlatan Ibrahimovic waiting in the wings though, don’t expect Lukaku to start all of these games. In defence, Smalling and Jones are cheaper options. Manchester United have kept the most clean sheets so far this season, expect the trend to continue. Again, keep an eye on minutes in the League Cup, ahead of Gameweek 19. While you’re here, don’t forget to keep an eye on the Festive Fixture Schedule.